Bordered by Lake Oswego, Gladstone and Oregon City, among others, West Linn is one of Portland's most desirable suburbs. An area of early development, prompted partially by the easy availability of electricity in the form of Willamette Falls, located close by, West Linn incorporated in 1913. It is located between the Willamette and Tualatin Rivers and largely residential. Its early settlement has left a mark on the town in the form of historic architecture and an officially recognized Historic District composed of 75 properties and antique streetscapes as well as a row of iconic storefronts. Property options in the area encompass not only a range of apartments and condominiums, but a huge variety of single-family homes as well. 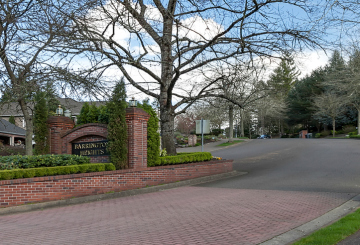 Many are very wealthy, some located along the waterfronts or on West Linn's rolling hills, offering splendid views of the rivers and surrounding areas.